From what I have learned while studying coworking this past summer, I think it is safe to say that the working world is rapidly changing as my peers and I enter the workforce.Ãƒâ€š And one prominent factor driving this evolution is the interconnectedness of our modern world. The internet, video conferencing, and cloud-based networks all enable us to have interactions and to share information with people halfway around the world — or simply across the room.Ãƒâ€š Location has, in many instances, become a non-factor in how we connect with people. During the last academic year, I spent my fall semester traveling around Europe with a group of other architecture students. The second stop on our trip was Nuremberg, Germany, where we met with a former Virginia Tech architecture student who was currently practicing in the city. He spent the day leading us around to several projects around Nuremberg.Ãƒâ€š One that stood out in particular was an office by the architect Matthias Lobermann. This office specializes in renting out workspaces for freelancing or traveling architects and designers for any number of days, weeks, or months — it’s entirely up to the tenant. The set-up is remarkable. It includes the typical office requirements: a desk, kitchen, lounge area, and of course, bathrooms. But it goes far beyond that. Residents have their own phone line and a receptionist at their disposal. They also have a range of meeting spaces and conference rooms available for use. A few are for more intimate client meetings and include high backed loveseats and armchairs to define the space. Others are geared for larger, more formal presentations.Ãƒâ€š These have several different desking options and a whole range of technological capabilities, including projecting and video conferencing. Back in the open studio, each tenant has a modular desk that can be reformed to suit his or her design and workspace needs. 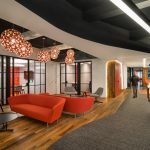 This enables designers and architects to create fully functional workspaces away from their base offices with very little effort on their part. I really saw the merit of what this office offered.Ãƒâ€š In our ever-globalizing world, a set-up like that simply makes sense. Granted, at the time, I had yet to apply for — much less begin — my internship with FOX Architects, where I spent the summer learning about how the changing workplace was affecting the world of workspace design. So I really had no idea just how prevalent this idea of temporary workspaces really is. After spending the last few months studying coworking, I can see that these spaces are everywhere — from Betahaus in Berlin to Affinity Lab in DC to BLANKSPACES in Los Angeles.Ãƒâ€š It is a trend that simply can’t be ignored — and I think is here to stay. Where you do your work doesn’t matter anymore.Ãƒâ€š It’s what you do at work that is important. I can definitely see this theme continuing and expanding during the lifetime of my career.Ãƒâ€š Let’s face it; my generation is known to be a little ADD. I mean, what can you expect when we spent our early years with two-minute “Sesame Street” segments, moved onto three-minute Youtube videos, and now get to listen to our politicians try to sway us using one- or two- sentence tweets? We have grown up in a world of ever-increasing speed and efficiency, where a thought is too long to share if it has 161 characters in it. I wouldn’t be surprised if this results in a generation of nomads who are constantly looking for a more interesting situation.Ãƒâ€š Give us freedom to roam and we’ll take it. While that is a wide generalization, I don’t think it is too far off base. The fact remains that our fast transportation and even faster technology allows us to travel and still stay connected like never before. It simply follows that coworking spaces will become even more prevalent as my peers and I become influential members of the working world, as they are very conducive to that kind of a lifestyle. To say the very least, entering the workforce at a less-than-stable economic time where outsourcing is the name of the game is a little daunting.Ãƒâ€š However, I’m excited to see where our rapidly changing world will take us. I have a feeling that the workplace will have undergone some major overhauls before I finally get to retire—when I’m 80. A very insightful viewpoint from the next generation, showing us how we have evolved in the new workplace or non-workplace as she noted. I wonder when higher ed will realize this as well ( having just seen a newsletter filled with auditorium seating- this will go by the wayside as we all lecture on Utube). The evolution of work will continue, but the need to interconnect still is primal. Technology will take the place of the standard cubicle, but people still need a place to sit down, whether it is their home office or inside rented temporary quarters.